Pharmexcil's circular on Status of Barcode dt.31.12.12. TO BE IMPLEMENTED FROM 1ST JANUARY, 2013.
i) Extension of effective date of implementation from 1st January, 2013 on secondary packing. As per the latest discussions with Government today, it has been informed that Government is not considering to give any extension for implementation of bar coding on secondary packing. Accordingly, bar coding on secondary packing would come into effect from 1st January, 2013.
a) Status of mono cartons – whether it is primary packing or secondary packing? The Government/DGFT vide policy circular No. 43(RE-2010)2009-14, dt. 25.10.2011 has earlier clarified with respect to bar coding on tertiary packing , that bar coding requirement for pharmaceuticals and drugs would be effective for products manufactured after effective date of implementation of bar coding . Accordingly it is indicated that bar coding on secondary packing would become effective for those products manufactured on or after 1st January 2013 only. The Government/DGFT had already clarified vide policy circular No.48(RE-2010)/2009-14, dt. 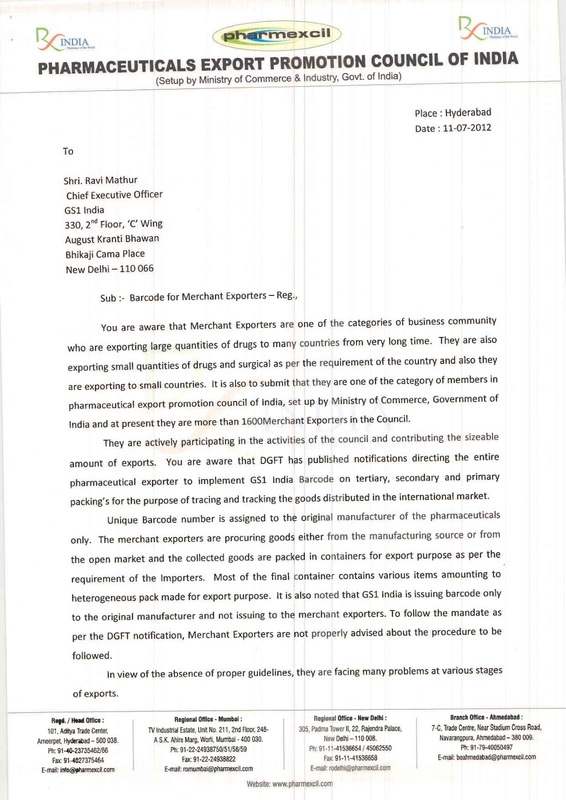 28.11.2011 that bar coding requirement is applicable only in respect of finished pharmaceutical products i.e. medical formulations and not bulk drugs/APIs/Intermediates. d) Bar coding for merchant exporters and Ayush products. 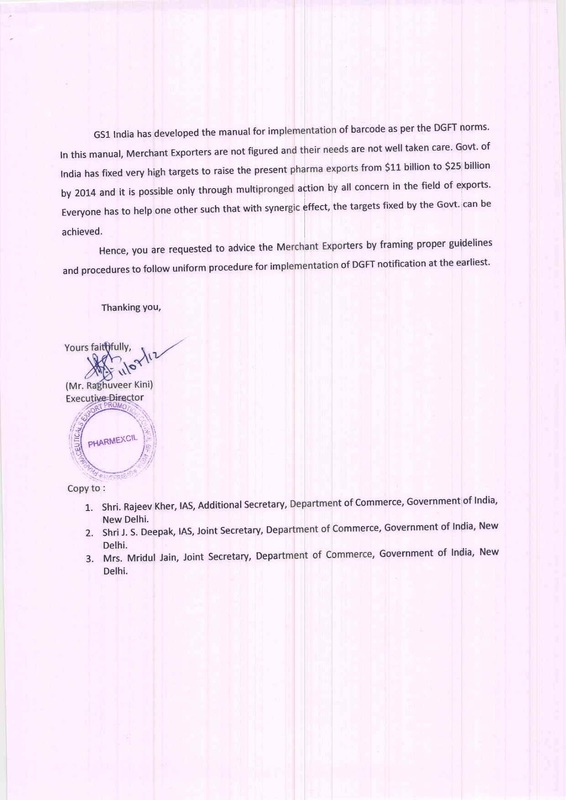 Pharmexcil has already taken up this issue with the Government and clarification is awaited. In the absence of clarification, it would be necessary to meet the bar coding requirement. Members are requested to kindly note the above position for implementation of bar coding on secondary packing. Our Council would extend all possible help with timely representations to Government and early clalrifications (to the extent possible) to the members on this subject. Accordingly, if any country has already implemented a system for tract and trace purpose, the Indian exporter need not follow barcode system. Based on information received from members, Pharmexcil will take up such issues with Govt. for issuing exemption to such individual countries. Members are requested to inform council with details of such countries if any where the track and trace for pharmaceuticals products is mandated. Season’s greetings and best wishes for a happy and prosperous New Year! As per our discussion with your officers, considering Indian export packaging processes and practices and to facilitate the compliance on barcode requirements stipulated by DGFT , the primary level barcode requirements shall be applicable on mono carton. The attached manual could be hosted on your website and made available to your members to clarify the same. http://www.gs1india.org/service/education-training/online-training and the same could be communicated to your members. Should any further technical clarification is desired your members they may approach our implementation team for support.